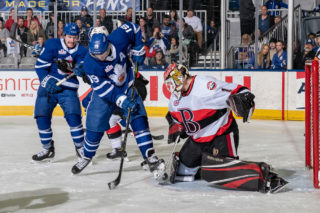 The Toronto Marlies knew the importance of getting off to a quick start in Game 3 after finishing a five-period marathon less than 24 hours before puck drop in Syracuse, and they executed that perfectly in Syracuse. Six different Marlies found the scoresheet in a 7-1 road victory that snaps a string of six straight road losses in the playoffs for Toronto. Chris Mueller got the scoring started less than three and a half minutes into the game, scooping up a rebound and sliding it past an outstretched Connor Ingram. 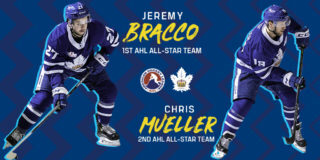 Justin Holl and Ben Smith had the assists on Mueller’s second of the playoffs. Just over a minute later, Carl Grundstrom finished off a pretty passing display from Miro Aaltonen and Andreas Johnsson in close, finding the back of the net for the fourth time this postseason. The Marlies would carry that 2-0 lead into the first intermission following a period where they outshot Syracuse 11-3. After Syracuse found themselves in some penalty trouble to start the second, Miro Aaltonen notched his first career AHL playoff goal just past the midway point, tapping in a redirect off a hard pass from Johnsson. Grundstrom had the secondary assist, giving each of them two points on the night. Less than four minutes after that, Colin Greening rushed to the side of the net and found a loose puck before tucking it in to extend the lead to 4-0. Linemates Frederik Gauthier and Pierre Engvall had the helpers on that one. Syracuse’s Erik Cernak cut into the lad with under three minutes to play in the second, beating Calvin Pickard for what would be the only time on the night. Trevor Moore flew through the neutral zone and picked up a loose puck, breaking in alone and going top shelf to put the Marlies up 5-1 with 11:37 to go in the third. Vincent LoVerde had the assist. 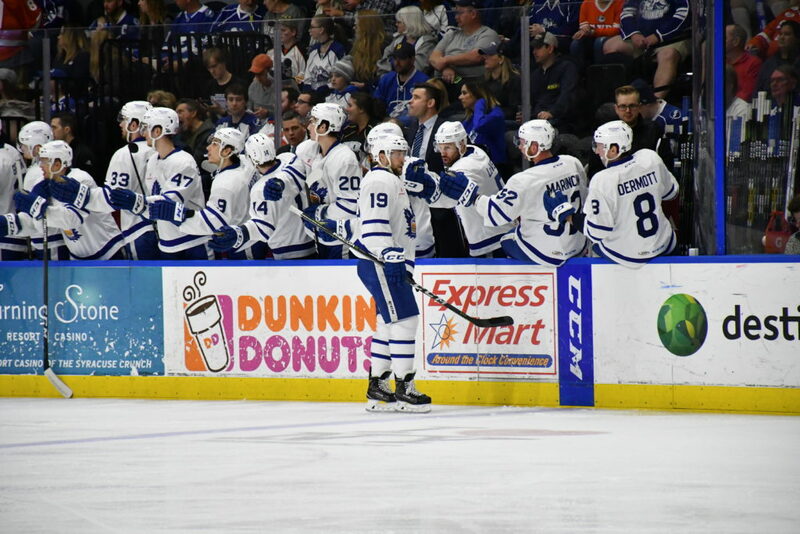 In the final five minutes, it was Andreas Johnsson’s turn to be sprung on a breakaway and he fired a slapshot past Ingram for his second since rejoining the Marlies. Timothy Liljegren had the assist, his first career AHL playoff point. Moore would go on to add another, driving to the net and redirecting a pass from Mueller to make it 7-1 with under two minutes to go. Johnsson finished the night with three points and was named the game’s first star. Pickard made 18 saves in his first career professional playoff start, earning the win. He now holds a .949 save percentage and 1.15 goals against average in two appearances this postseason. Ingram, who also started for Syracuse on Saturday, stopped 23 of 30 shots. 13 different Marlies registered a point in the win, including Pickard who had an assist. It was the fourth time this postseason that the Marlies have scored five goals or more and it was only the second time that Syracuse has been held to two or less these playoffs. The effort gives the Marlies a 3-0 series lead in the North Division Finals with Game 4 set for Tuesday night in Syracuse. Chris Mueller opened the scoring at 3:23 of the first period. Mueller has five points (2 goals, 3 assists) through eight games this postseason. Carl Grundström scored at 4:35 of the first period and later added the secondary assist on Aaltonen’s second period goal. Grundström has six points (4 goals, 2 assists) through eight games this postseason. Miro Aaltonen scored at 10:39 of the second period and earlier had the primary assist on Grundström’s first period goal. Aaltonen’s goal was his first of the postseason and his fourth point (1 goal, 3 assists) through eight games. Colin Greening scored at 14:05 of the second period. Greening has four points (3 goals, 1 assist) through eight games this postseason. Trevor Moore scored at 8:23 and 18:20 of the third period. Moore is tied for the AHL-lead with nine points (3 goals, 6 assists) through eight games this postseason. Andreas Johnsson scored at 15:08 of the third period and earlier had the secondary assist on Grundström’s first period goal and the primary assist on Aaltonen’s second period goal. Justin Holl recorded the primary assist on Mueller’s first period goal. Holl has two points (1 goal, 1 assist) through eight games this postseason. Ben Smith registered the secondary assist on Mueller’s first period goal. Smith has six points (1 goal, 5 assists) through eight games this postseason. Frederik Gauthier recorded the primary assist on Greening’s second period goal. Gauthier has seven points (1 goal, 6 assists) through eight games this postseason. Pierre Engvall registered the secondary assist on Greening’s second period goal. Engvall has six points (3 goals, 3 assists) through eight games this postseason. Vincent LoVerde had the primary assist on Moore’s third period goal. LoVerde’s assist was his first point through eight games this postseason. Timothy Liljegren had the lone assist on Johnsson’s third period goal. Liljegren’s assist was his first point through eight games this postseason. Calvin Pickard stopped 18 of 19 shots he faced against the Syracuse Crunch and picked up the secondary assist on Moore’s third period goal. This was Pickard’s first-career professional playoff start. Pickard is now 1-0 in the playoffs with a .949 Save Percentage and a 1.15 Goals Against Average. Toronto went 4-for-4 on the penalty kill and 0-for-3 on the power play. Toronto had a 30-19 edge in shots in all situations. Andreas Johnsson led the Marlies with five shots on goal. We have to turn the page here now. This game is over with. Everything’s going to reset itself back to zero. It’s going to be a rested Syracuse team. When we play them again, we know what to expect. It’ll be more of the type of game that we saw in (games) one and two, we know that. We have to regroup ourselves here and recognize the next one will be even tougher. Vital. We were coming off of yesterday’s win up two (games), coming in here against a team that when they get momentum, it’s hard to get it back from them and their crowd behind them makes it even more difficult so that first period was huge for us. To be honest, we had a little bit of a demon here to conquer in terms of ability to win on the road and that goes back to last season against this team but even in the first round against Utica where we could have finished the series off but failed to do so because we couldn’t get it together on the road. To have a period like that was real nice response by our guys and a bit of a statement that we’re taking that next step as a team. But as a I said, it’s going to go back to zero and that’s going to be a much better Syracuse team on Tuesday night and we have to take care of ourselves and have our best game of the series. This is a team win. All of the players, obviously, to bounce back the way that they did. The training staff, everybody in the organization that put the work in all year to prepare for these types of turn-arounds, those types of overtimes and just to take care of our guys the way that they did. Training staff, taking care of bumps and bruises and all of those kinds of things. This is the time of year where all that stuff comes to a head. It’s good to see that we passed the test. 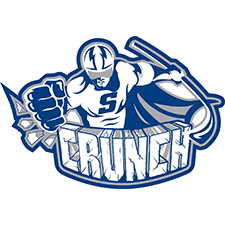 Less than 24 hours after Frederik Gauthier scored from his stomach to end a double overtime battle, the Toronto Marlies and Syracuse Crunch are slated to do it all over again in Game 3. 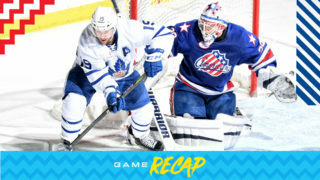 Saturday’s win put the Marlies ahead 2-0 in the best-of-seven series, which now moves to Syracuse for the next two games. 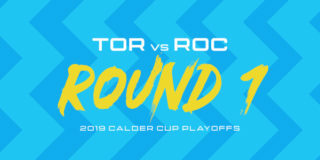 It will be a tough test for the Marlies, who were unable to secure a victory in either road game during their first round series against Utica, while Syracuse won both home games in the first round and have won 13 of their last 14 playoff games at home stretching back to last year. 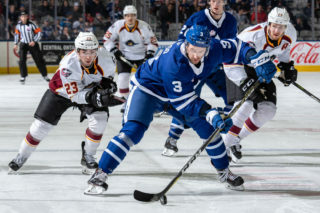 The Marlies found the secret to success away from home throughout the regular season, however, posting a league-best 30-5-1-2 record on the road. They’ll look to keep that success rolling into the second round, facing a hostile Syracuse crowd. Gauthier’s overtime winner was his first goal of the postseason and he has now earned six points in seven games, tied for second in team scoring this playoffs. Trevor Moore setup Mason Marchment’s third period goal for his sixth assist and seventh point, leading the way for the Marlies. 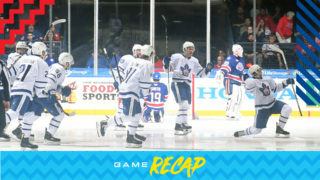 At the other end, both Matthew Peca and Gabriel Dumont returned from injury for the Crunch in Game 2, with Peca scoring their only goal of the contest. He leads all Syracuse skaters with three goals and nine points in four games played. Both teams will look to get the power play working in Game 3, as the Marlies went 0-for-5 and Syracuse was 0-for-3 in Game 2. The Marlies came up with two enormous penalty kills in the overtime frames on Saturday, improving the postseason percentage to 80.8%. They will look to build off that momentum tonight. Puck drop is scheduled for 7:00 PM and fans can tune in on Leafs Nation Network (TV) or AHL Live. Follow us on Twitter for pre- and post-game coverage, as well as live updates from inside the Oncenter War Memorial Arena.